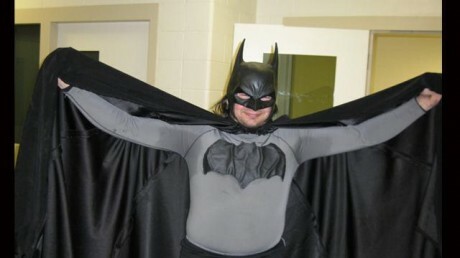 Welder dons Batsuit, builds Batpod becomes Chibatman! Here in the states we’re all pretty used to Christian Bale as Batman getting in peoples’ faces and barking like he’s trying to carry on a conversation in a dance club. But what if there was a kinder more approachable version of the Dark Knight who’s only mission was to bring smiles to an area rebuilding from a devastating earthquake. Well there is such a person. A 41 year-old Chinese welder’s donned Batman’s suit (thankfully not the Clooney one) since 2011 as well as built his own version of the Batpod and taken to the streets to simply make people smile. Might be more superheroes in the world. Posted in Batman, China, Comics, Super Hero, Superheroes | Comments Off on Welder dons Batsuit, builds Batpod becomes Chibatman! A man dressed up like the crime fighter was busted by police while hanging from the wall of a downtown business. No word yet what he was actually trying to accomplish. In a release, the Petoskey Department of Public Safety said officers pulled the man back onto the roof and found a baton type striking weapon, a can of chemical irritant spray, and a pair of lead lined gloves. The suspect, a Harbor Springs resident, was arrested for trespassing and possession of dangerous weapons. I like to think he wears lead-lined gloves in case his buddy Superman needs help with any Kryptonite. We’ve long been a proponent of geek cultures vast importance over other pop culture products for one reason: geeks make things. Geeks see Star Trek communicators and build cell phones to look like them. Geeks see Star Wars light sabers and build real destructive lasers with awesome handles that receive cease and desist letters (since rescinded) from Lucasfilm. And finally, geeks read about the super light, highly technological armor of Batman and build it for the Air Force. Grappling hooks attached to siphon electricity from low-hanging power lines. Computers mounted onto a commando’s chest plate. 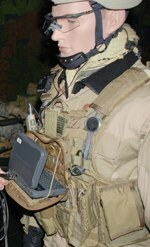 Communications gadgets small enough to fit into gear pouches worn around the waist. The Air Force is actually preparing its special operators to act (and outfit themselves) more like the Batman. They even shoe-horned in a clumsy acronym to complete it! It’s officially called The Battlefield Air Targeting Man-Aided kNowledge.